nazninazeez - Page 2 of 61 - A blog about beauty, makeup, giveaways, book reviews, health and other random interesting topics! The Love of Your Life – Growing Closer with Your Special Someone! Love is the most powerful emotion that a person can experience. It has the power to make us act irrationally to please the object of our affections, forgive mistakes and insults that we wouldn’t otherwise let slide so easily, and it makes us feel like life is worth living, no matter what else goes wrong. But keeping a close relationship between two people over many years can be challenging, no matter how strong the bond of love is between you. Other obligations like work, our social circles, and yes, even our children (though we love them dearly), can all be factors that prevent you from staying close to your special someone. If you’ve found that you and your partner have started to drift apart, or even if everything is just fine, but you’d like to grow even closer, here are some ideas to help you reconnect with your one and only. Finding common ground is one of the first steps to developing a relationship, beginning well before you start dating or even before your first kiss. To keep the butterflies fluttering between you as time goes along, a great option is to get back to those activities you both enjoy that you can share together. This doesn’t mean you have to get fancy and spend a ton of cash every week. You can do some simple activities, like watching a TV show, cooking, going for a walk, or taking your child to the park together. The key is that you’re sharing an experience together. Even if your attention is mostly focused on what you’re doing, that’s okay: your partner knows that you’re doing it with them, and that shared experience will give you something to discuss after you’re finished, the memory of time spent in each other’s company, and will reaffirm that the love of your life will be there for you when you need them. Tying in with the first idea, if you want to grow closer to your lover, you need to make it a priority, and so do they. This means setting your obligations aside, and blocking off dedicated time to spend with each other. When we first start dating, we turn into the best version of ourselves to both attract and please our partner, to give ourselves the best shot at winning the heart of our crush. We’re way more particular about hygiene, how our hair and makeup looks, and we always dress to impress. Our focus is completely on each other, and the romance is at its peak. As time goes on, and we get comfortable, we often stop putting in all that effort to look our best and act a certain way because, quite frankly, it’s just way too much work. This is normal for almost all couples, and it doesn’t have to kill your relationship. In fact, Julia, who runs a marriage counselling practice in Sydney has a great post on the transition from romance into true love. Still, we like to feel like our partner has eyes only for us, and it makes us feel incredibly good to put on our little black dress, spend an hour on our hair, and pull out the expensive perfume, because when we look good, we know it. And so does our partner. Taking a date night will not only give you both a break from life’s other concerns, it will help you rekindle the romance that you felt way back, and remind both of you that the person you love is well worth the effort to look your best. Many couples are hesitant to discuss their relationship with others, even close and trusted friends. This is completely understandable. However, often we feel like the depression we experience, and the possible guilt or anger that comes with it, from our relationship woes is unique to us. This can make us feel isolated, alone and that there’s something wrong with us. Connecting with other couples can be crucial to maintaining your own love life, because you can both see that you’re not alone in your struggle, and it’s 100% possible to improve your relationship. Sharing your stories and advice together will help other couples through their relationship concerns, and will almost certainly lead to some great advice for your own. You don’t have to treat your blog like a tabloid, spilling every dirty secret between you; you can be as open as you choose to be. illustrate more general topics like relationship advice. You’re probably thinking, “What?!? No! That’s dumb! We’re growing apart as it is!”, but hear me out. Often times, one thing that can lead to feelings of isolation, or a widening gap between couples is that one or both feels crowded. When we’re constantly bugging each other about the money in our bank account, whose turn it is to do the dishes, asking, “Why can’t we take a vacation right now?”, and other similar concerns, we can often make our partner feel like we’re crowding them, only coming to them with our problems, and that we don’t value their space. After marriage, or even after if you’ve been dating a while, it’s easy to forget that you’re both individuals, and before you came into each other’s lives, you had your own way of doing things, with your own schedules. While we can and definitely should change our ways to help strengthen our relationships, the reality is that we’re still people; we need to be allowed to do certain things the way we want to do them, and when we choose. On the other hand, we also need to respect those boundaries for our partner as well. If you and your partner don’t seem keen to interact as much anymore, or you sense there’s tension when you do talk, consider giving the other some space. Don’t get me wrong: if you sense a deeper issue is at play, you need to open up and discuss it with your partner first; as the old saying goes, “Bad news doesn’t improve with time.” But once you’ve had that discussion, if you or your partner feels crowded, give each other time to pursue your own interests. Go out with your friends, watch TV in different rooms, or split up when you go shopping. Your partner will appreciate that you respect their boundaries and feelings, and after some time to recharge, you’ll be the first person they want to reconnect with.. Relationships can be tricky from the beginning, and keeping a relationship going can be trickier still. You’re going to have bad times in your relationship, potentially so bad that you’re tempted to call it quits. This is normal, and you need to both accept and understand this because it will turn your relationship concerns from an insurmountable roadblock into a challenge that you can face and overcome together. The important thing to remember is that you love your partner, and they love you, even if you don’t feel it as strongly as you both once did. Remember that you were both drawn to each other for a reason, and though we evolve and grow as time goes on, never forget that what was true then can still be true today. If you do, you will still face those same hardships, but you’ll be able to overcome them together. Kerala Flood – My First Hand Experience! 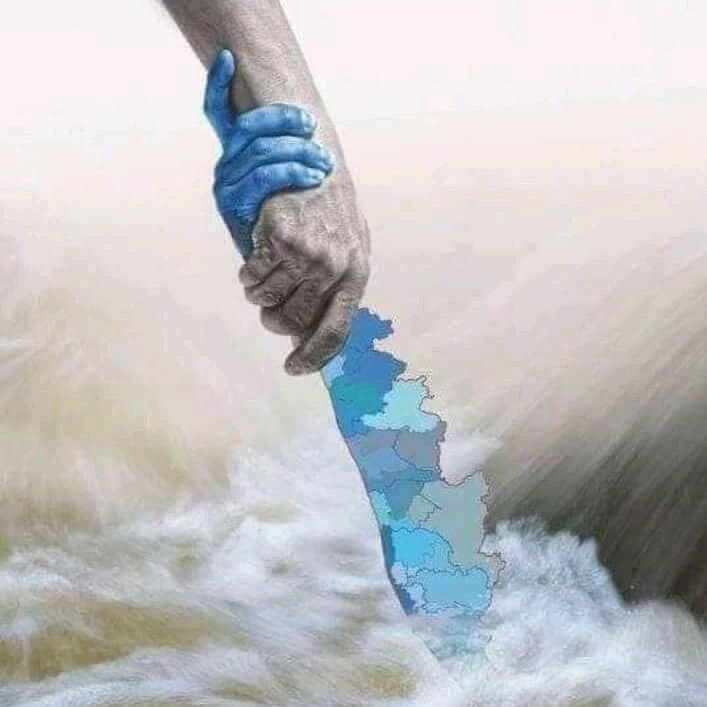 I have been right in the middle of the Kerala flood and I can tell you, it’s too much. Never have I ever seen anything like this in my life. Sure, I’ve seen news about things like this happening around the world. But once it happens to you personally, everything is put into perspective. Being a beauty blogger, I realize now how materialistic I am. How beauty products, creams and such matter so much to me. But having seen people suffer so much, I am humbled that my house hasn’t been affected too much. My parents were out of electricity for 3 whole days but they too haven’t been affected by the flood as such. Some of our neighbouring houses though have just fallen apart. They belong to poor people and my heart goes out to them. My husband went out for volunteering at camps and what he says to me is alarming. The camps have anywhere between 500 – 5000 people, some of whom don’t even have an extra dress with them. They just fled from home in whatever attire they were in. So many babies and kids, having no idea what’s going on around them and crying. We were able to buy rice, vegetables, sugar, salt, more basic things like that, in bulk for them. I am happy I could do at least that much for them. Supermarkets have run out of products due to high demand. ATMs have run out of cash. There is no diesel/petrol available. I am also alarmed that many are charging exorbitant prices for the things they are selling just because they know people will buy it somehow. What a sad situation.. Mobile networks are down. There are no ways of communication. Thankfully, the landphones work. Another major problem is that in this flooded water, there are plenty of snakes. It’s such a dangerous situation. Also weeks later, even once this flooded water has flown on/dried and withdrawn, still there is a huge chance of a major breakout of various kinds of waterborne and airborne diseases. God help us! If you would like to help & contribute financially to these affected people, kindly get in touch with me via email – nazninazeez@gmail.com. Please put ‘I wish to help’ in the subject line. I personally know so many families in need and even the smallest amount would help in restoring lives back to normalcy. Six Things Your Hairdresser Wished You Knew! Hairstyling is a skill, and when you walk into the salon, you should not expect your hairstylist to guess the hairstyle that you would like. There are a couple of things that your hairdresser wised you knew before you come for your appointment. If you want the hairdresser to transform your hair into the style you want, you have to give him/her some directions. With the basic knowledge of what you want, your hairdresser can now bring his/her proficient skills. That said, this article will list down six things your hairdresser wished you knew. One of the things your stylist wished you knew is the importance of trimming your hair. Your hairdresser knows that dry, brittle, and damaged hair is not appealing, and it gives them a hard time when they are applying color because it doesn’t hold. Such kind of hair also has a hard time maintaining the desired texture. If you don’t know the tool that will work best for your hair, you can log on to hairclippersclub.com to get the most suitable clipper for your hair. By implementing this, your hairdresser will have an easier time styling your hair. Another thing that your hairdresser wished you knew is that color jobs vary a lot. Here, your stylist would appreciate it if you exercised a lot of patience. After all, it is said that patience pays. If you want to have your hair colored, ensure to inform the salon about what you are expecting. You should do this when you are booking an appointment. Moreover, you need to know that some color jobs are more complicated than others, and they may take longer to complete. Make sure that what you booked for is what you are coming for because rescheduling a color job might be very tricky. When you head to the salon, you have an idea of what style you would like. However, your hairdresser is not psychic to know the hairstyle you want. The best way for your hairdresser to have a clear understanding of the style you prefer is through pictures. Therefore, ensure to bring a lot of them. It is advisable to bring pictures that have different lightings, and they should show different angles. It could help your stylist to get very particular with the details. Your hairdresser would like for you to know that when you walk into the salon, you are going to get quality services. You cannot compare the quality of service and products that are in a salon with those that you get off a supermarket shelf. You need to know that your hairstylist knows the products that work best for your hair. Supermarket products may have hidden ingredients that may end up damaging your hair. Therefore, it would be wise if you invested your time and money in a salon. As mentioned before, your stylist cannot guess what you want to be done to your hair. Therefore, it is vital for you to be honest with your hairdresser, especially about your hair’s history. It could help the stylist treat your hair in the most deserving way. Honesty doesn’t stop at that. You also have to talk to your stylist about your spending limit and ensure to confirm the upkeep costs. It could save you a whole lot of trouble. Furthermore, if you are not happy with your current hairstyle, talk to your hairdresser to change it. Before you check into your salon appointment, you have to ensure that you clean your hair. It is not advisable to come to the salon with hair that hasn’t been washed for weeks, waiting for your stylist to wash it. There is a high probability that your hairdresser will be grossed out by it. And if you want to color your hair, hair that has a lot of product could cause the color to appear unevenly. Going to the salon is essential when you want your hair done professionally. However, before you check into your appointment, there are a couple of things that your hairdresser wished you knew. And the most important ones are mentioned above, and it would be great if you adhered to them. Must Have Beauty Products for Every Fashionista in 2018! If your bangs are wilting or you didn’t have time to wash your hair last night, these portable hair blotting tissues will help you out. The sheets’ ingredients include kaolin and charcoal to help blot up excess oil at hair roots easily. Toss a pack in your purse and use for a portable touch-up anywhere you go. Comes in packs of 16 sheets. Around $18. If you’re prone to breakouts or would just like to get your pores really clean, try this super-foamy facial cleanser. It’s formulated with both baking soda and salicylic acid to get your pores and skin clean, clean, clean! Around $7. This liquid lipstick is highly pigmented for those times when you want to stand out from the crowd. Available in 12 shiny, metallic shades ranging from gold to pink to blue. Around $6.99. Hot summer days are coming and sometimes last night’s shower just isn’t enough. Freshen up anytime or anywhere with this naturally-formulated product. Spray on your skin to revive it. Wipe away sweat and grime. This product is formulated with coconut water and scented with mimosa. Around $8 for a 6.7 ounce spray bottle. This conditioner is great for fine, thin hair. It’s mousse-light and hydrates hair without adding too much weight. Around $5.99. Now you can have longer, lusher lashes without that stiff, coated look. Total Temptation mascara is enriched with coconut extract and delivers color and volume to your lashes while still maintaining a natural look. Available in various shades. Around $10. Contains only 5% benzoyl peroxide, making it effective against breakouts but still mild enough for sensitive skin. Around $12. Tired of hairsprays that make your hair look like a helmet? Then try this product. The ultrafine mist doesn’t just settle on the outside of your hair. It works with your style to hold, while still allowing bounce and movement. Around $5. It’s hard to paint your fingernails evenly. Make the job easier by using these peel-off cuticle protectors. Get a perfect manicure every time! Around $5.99. Tame frizzy hair on the go with these coconut oil and shea butter enriched sheets. Easy to carry and use anywhere. Adds shine, too. Around $18. These are just a few new products to try that offer great benefits but are still easy on your pocketbook. Pick a few and give them a whirl! Kelsey is the editor at LuxAuthority and is trying to balance both her budget and her credit card balance. She likes to live lavish and treat herself when the opportunity allows it. She loves the newest tech, old cars and the smell of rich mahogany and leather bound books as well! Five beauty products that are totally worth the money! When considering which beauty products to buy, you might be wondering whether or not it’s worth it to spend more. Are less expensive products just as effective as their more expensive counterparts? You might be surprised to learn that when it comes to beauty products, sometimes spending more means getting better results. Find out which beauty products are totally worth the money. From makeup and skincare to hair products, here’s the low down on products that you shouldn’t skimp on when it comes to finances. When it comes to facial moisturizers, you’ll want a quality product that’s filled with nourishing ingredients. Some of the less expensive products on the market tend to have ingredients that can cause adverse effects including drying, acne, or even redness. If you have oily skin, you’ll need a light moisturizer that’s free of oils and will be absorbed by the skin quickly. On the other hand, if your skin is very dry, you’ll want a hydrating moisturizer that will leave your skin looking dewy and radiant. For your whole body, a moisturizer designed for the body is ideal, and, like your facial moisturizer, should be designed for your skin type. Because of the many different factors that go into choosing a moisturizer, it’s perfectly fine to splurge on one that’s designed specifically for your skin. There are dozens of types of primers on the market. There’s face primer, eye primer, and lip primer. There are color-correcting primers, primers with SPF, primers that prevent acne, cream primers, gel primers, and even powder primers. With so many different primers on the market, you might wonder, Which one do I need? It’s wise to choose a quality primer that you can use over the entire face, but if you’re using cream shadows it’s good to invest in a good eye primer. Love red lipstick? You might want to invest in a quality lip primer, too. When choosing a primer, again it’s important to know your skin type. There are primers that will hydrate, hide blemishes, brighten the skin, and tighten the pores. Understand what you need and choose a primer that will do more than add wear time to your makeup. Foundation is one of those products that you can waste a lot of money on if you don’t get one that’s perfect for your skin. This is why it’s recommended to spend a little more on a product that you know will work for you. Spending more on foundation is absolutely worth it. Inexpensive foundations might provide little coverage, dry out the skin, or end up looking cake-y. In some cases, inexpensive foundation brands do not have enough shades to match your skin tone. Having a foundation that matches your skin tone closely is absolutely necessary for a flawless look. With that said, it’s best to just skip the drugstore. Not sure which foundation is right for you? Head on over to your local makeup counter and talk to an expert. They’ll help you find the right shade and formulation for your skin tone and skin type. Do you need a tinted moisturizer or a full-coverage foundation? These are questions that they can help answer. Also, keep in mind that during the summer and winter months, your foundation shade will change. This is another reason why spending more is better when it comes to your foundation. Not only will cheap brushes wear out more quickly than a pricier brush, but the bristles on cheap brushes can actually damage your hair! The plastic bristles on inexpensive brushes can pull and break your hair, leading to split ends and hair that has completely broken off. Boar bristle hair brushes are gentler on the hair, reducing breakage. They distribute natural scalp oils throughout the hair shaft, boosting shine and hydration. are highly recommended for all hair types. They do cost much more than the cheap brushes, but are totally worth the investment—and in some cases, can last a lifetime! If you’ve ever tried a drugstore brand of shampoo or conditioner and then switched to a more expensive brand, chances are you notice a huge difference in the two. According to experiments conducted by Huddersfield University and led by chemist Dr. Laura Waters, expensive shampoos actually do provide better treatment to your hair in comparison to the less expensive shampoos. Most of the cheaper shampoos do not contain conditioning agents, which reduce static after washing. It was also found that the less expensive products make hair attract even more dirt! Needless to say, by switching to a high-quality shampoo and conditioner, you can go longer in between washings and reduce static and breakage, leading to healthier hair. So, it’s absolutely worth it to spend more on shampoo and conditioner! The next time that you’re shopping for beauty products, remember that less doesn’t always mean more. From skincare products to hair care, it’s absolutely worth it to spend more on certain brands.